What's the best way to support vinyl hanging signage at large-scale community events? Check out our street banner hardware for light pole signage that is visible from a road or sidewalk. These pole brackets secure hanging flagpole advertising for town-wide historic and seasonal celebrations. Attract attention to fairs, parades, concerts, car shows, outdoor bazaars, sporting events, and more. 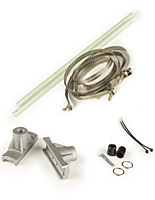 Our street banner hardware comes with an adapter bar that adjusts to fit various rod sizes and shapes. Buy two systems for mounting additional posters as needed. Displays2go.com offers street banner hardware for outdoor advertising signs in bulk. 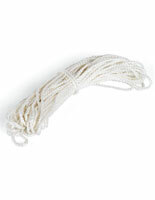 Enjoy wholesale pricing when you purchase this way. Custom vinyl graphics are not included. Organizations can use their own branded artwork, or buy it separately. 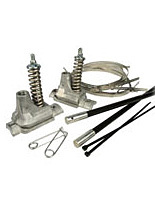 Our pole mounting brackets hang upright flag systems from street lights. This creates a dramatic effect for visitors driving into town, or walking through it. Our pole brackets for outdoor use secure flagpole advertising above roads and walkways. 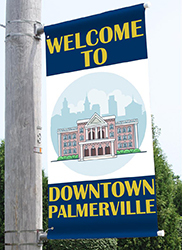 Enhance town-wide historic and seasonal celebrations with this high impact signage. Promote events with street banner hardware that looks great, holds up, and stays put. What features do the pole brackets offer for vertical hanging signage? 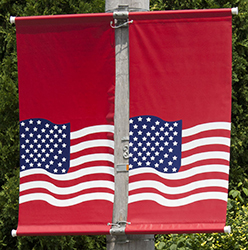 Our street banner hardware has adjustable screw gear banding to fit any size flag pole. These bracket systems pull vinyl artwork taut by increments, so messages are clear. This post sign hardware in cast aluminum won’t rust. The system is laboratory tested for resistance to high winds. 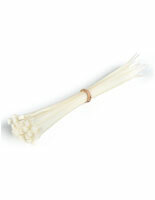 The fiberglass poles used in our kits are better than plastic because they are resistant to breakage. 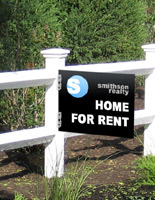 Mounting systems enable single- or dual-sided sign configuration. Place posters side-by-side, or one over another. 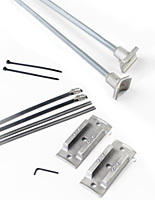 Brackets stay centered on the pole with sturdy aluminum set screws, so they are secure. There's no need to schlep to the hardware store! 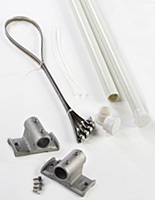 Our banner hardware kit includes everything needed for mounting signage to flag poles and street lights. Refer to the instructions - they are easy to understand. There are so many ways to create heavy duty outdoor banner advertising! Promote large-scale, city-wide events with vibrant signs and durable hardware from Displays2go.com. Enjoy fast shipping for in-stock accessories and signage. Ask our team of customer care experts about timelines and inventory. 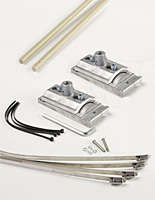 Our hardware is a breeze to install. Don't stress about putting on up city-wide or neighborhood events. We've made it easy!